...that there are actually different types of body butters? I had no idea to be honest and thought they were all the same apart from the different scents. One thing I have mentioned several times on my blog is that despite my dry skin I do find their body butters a little too heavy and my skin has trouble absorbing them. When The Body Shop contacted me asking if they could send me a body butter to review they informed me that they do actually have lighter body butters that might work better for me. So I said I'd give one of those a try and they sent me Fuji Green Tea* and Moringa*. When I accepted I didn't think I had any of their body butters at the moment. I was wrong. I have three! For a start how could I forget I have the Piñita Colada body butter when I featured it on my blog last month! Apologies but this one isn't actually available anymore as it was this years summer limited edition scent. Next year The Body Shop's body butters will be 25 years old; they were launched in 1992 and were the first body butter product. Since then they have won many awards and are one of The Body Shop's most popular products and it's claimed that several celebrities are a fan including Victoria (and David) Beckham, Reese Witherspoon, Jennifer Lopez and Serena Williams. As I said, what I didn't realise was that there are actually different types of body butter for different skin types. To be honest I should have noticed this as my Wild Argan oil body butter is very solid, much more solid than the other two I didn't realise I owned. Also if you look on the side of the tub they also say 'For normal to dry skin' or 'For dry skin'. I have body butters from each of three categories of 'Normal to dry', 'Dry' and 'Very dry'. British Rose, Fuji Green Tea and Pinita Colada are all for normal to dry skin types and (along with Satsuma) are the lightest body butters available. British Rose does contain a subtle shimmer and so is categorised as 'Instant Glow'. Fuji Green Tea is categorised as 'Replenishing' but unfortunately I don't how Pinita Colada fits into this because it was limited edition and so doesn't feature on the table. Moringa then falls into the next category for dry skin types and is categorised as 'Softening', as are all the butters in this category. Finally Wild Argan oil comes under very dry but is in its own category of 'Sublime Nourishing'; I believe making it the most intense of all the body butters available. Looking at the Wild Argan oil one compared to the Fuji Green Tea one you can definitely see this. As I said Wild Argan oil is very solid whereas Fuji Green Tea is more like a thicker cream. I have tried both of the lighter versions I was sent and they definitely are much better for me than the thicker versions. I try not to use too much, because overloading my skin is a good way to stop it absorbing what I've applied to it, and my skin absorbs it all and feels soft and nourished. 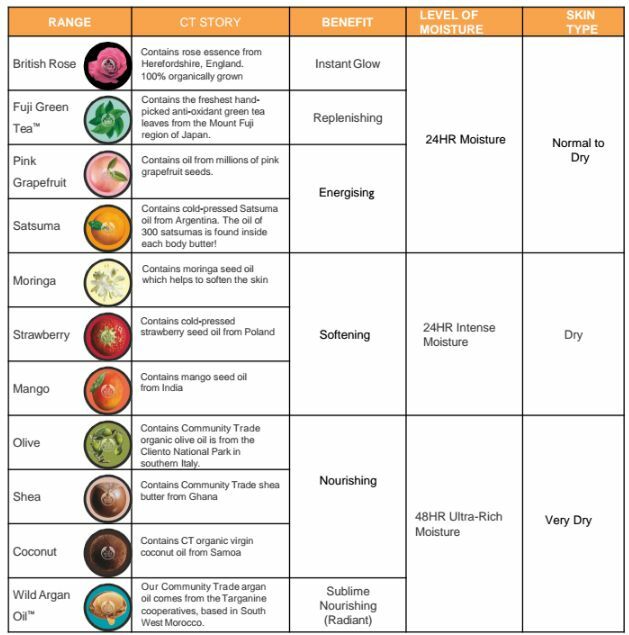 As well as celebrating their iconic body butters The Body Shop are also encouraging their customers to make small changes to their daily routine; whether that's by only taking three minutes in the shower or only boiling enough water in the kettle for the number of drinks you're making. You can take a short quiz here which will let you know if you 'Enrich or Exploit' and make suggestions as to the small changes you can make. Anybody who takes the quiz and tweets @TheBodyShopUK with #INOURHANDS will be entered into a prize draw to visit either a community trade supplier or bio-bridge project in 2017 to see first-hand the difference The Body Shop is making. For each tweet they will also make a donation to the World Land Trust to protect one meter squared of endangered rain forest. You can buy The Body Shop's body butters in store and online. 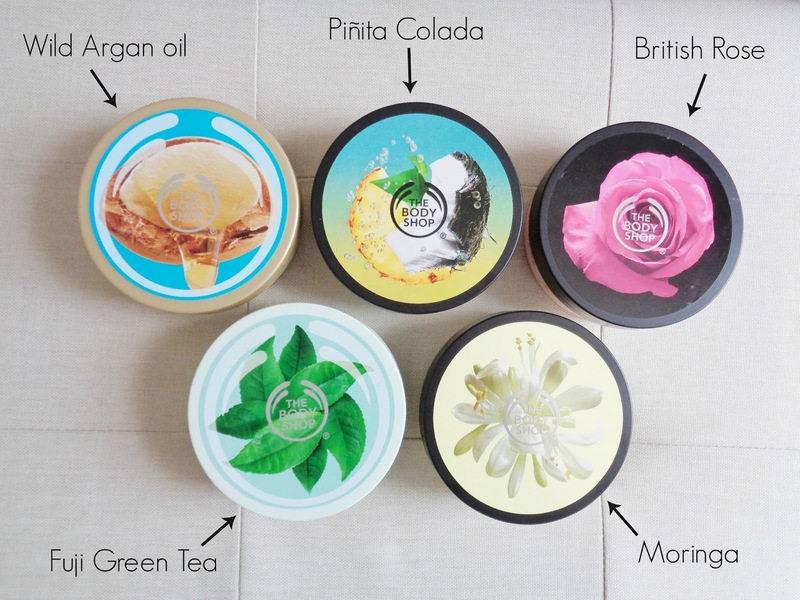 Are you a fan of The Body Shop's body butters?